Reverse Osmosis Technology was first demonstrated in 1959 by researchers at UCLA who were looking for an alternative to distillation to ecomomically extract fresh water from the sea. RO is a pressure driven separation process, producing purified water by forcing the water through a semi-permeable membrane while the impurities cannot pass through the membrane. While there have been different configurations for the membrane, today most industrial RO systems utilize spiral wound membranes. Spiral wound RO membrane elements operate installed in pressure vessels. A pressure vessel usually contains from one to six elements connected in series. An RO system can be configured to have a single pressure vessel (small systems) or a number of pressure vessels connected in parallel (array) or in series (stage). In a parallel array, all pressure vessels receive a similar flow of feed water and operate at the same recovery rate. The recovery rate depends on the number of membranes inside the pressure vessel. Each membrane is limited to a maximum 10 percent recovery. Therefore a pressure vessel containing 6 membranes should not exceed 60% recovery. In order to design RO system to operate at higher recovery rate, the waste water from an array (approximately 50% of the initial feed flow) is fed to another array, in series. Arrays are staged in series in a pyramid structure. The ratio of the number of pressure vessels of subsequent stages should be approximately 2 to 1, as the waste water from each stage is about 50% of the feed water to that stage. The water chemistry of an application will dictate the practical # of stages without fouling the membranes. 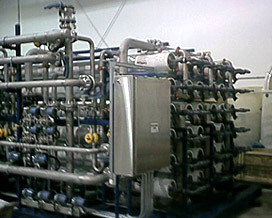 Double Pass Reverse Osmosis is a design where permeate from one system serves as a feed to another RO system. This design is used in applications where the primary RO cannot meet the water quality requirements.